Back in the spring of 2009, I started being attracted to cherry blossoms. First, I thought they were just pretty pink flowers; then I began to think that maybe God was up to something, trying to tell me something. Back then, as the cherry trees started blooming, I started thinking that maybe their blossoms would make a good logo, or theme, for my business. They would sure be pretty enough! Knowing that cherry blossoms were used frequently in Chinese and Japanese art, I figured that there would be some symbolism attached to the delicate blossoms. What I found was really interesting — and totally perfect as a symbol for what I do: helping women with fibromyalgia find hope and freedom! As I did my research, I discovered that in Japanese culture, the cherry blossom is a symbol of feminine beauty, just as in Chinese culture. From that point on, however, the symbolism was completely different in the two cultures. In China, the cherry blossom is a symbol of feminine beauty and strength. I even read in one place that it can symbolize feminine dominance! It is definitely a symbol of power. The more research I did, the more excited I got. I knew that I wanted to use cherry blossoms here, on my website, and in my logo. 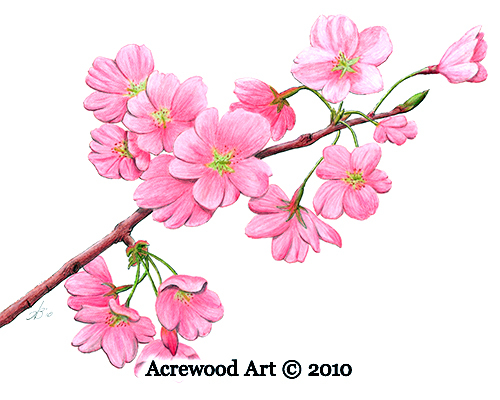 I also knew that I had to have my dad, Wayne Bricco, a pen and ink artist, draw me a cherry blossom picture I could use for my note cards. That’s the picture he drew for me, Promise of Hope, above. You can check out his website at AcrewoodArt.com. When I was suffering from fibromyalgia, especially back in 2008 when I filed for Social Security Disability, I truly felt like my life had been cut short. I felt like the “real me” was dying inside the prison of my fibromyalgia body. I felt like my body was falling apart, fragile. Even now, I sometimes feel like my continuing health is held in a delicate balance. My husband, Scott, even calls me, “delicate and sensitive.” Although, the healthier I get, the less often he says that! When I would have a particularly bad fibro flare, I used to get through it by remembering that, “This too shall pass.” I would do my best to remember that what I was experiencing was out of the ordinary and would practice my pain and stress management techniques to help bring things back under control again. Now that I have more good days than bad, I can say that the whole season of daily pain and fatigue has passed. I’m now in a new season of growing health. One of the things that has helped me the most in my healing journey has been learning that I am beautiful, just as I am. My husband taught me how beautiful I am when I was at my sickest, hardly able to function, and weighed a lot more than I wanted to. In the midst of all my comments of “I’m so fat!”, Scott thought I was the hottest woman he’d ever seen. I tried explaining to him that he was mistaken, but he insisted that he wasn’t. It wasn’t easy, but eventually I believed him! Once I believed I was beautiful, I also started to believe that my body was worth treating with kindness. That changed my attitude from a victim mentality, “God, why did you give me this defective body,” to one of power. I started to realize that the choices I made had a direct impact on how I felt. Things like getting enough sleep and feeding my body good food. As I started making better choices and treating my body with more kindness and respect, I started getting my health back. I literally gained more physical power and grew less delicate. You might say I went from a Japanese cherry blossom to a Chinese cherry blossom! My dad’s art business is a family affair, and we call my mom The Namer; she’s the one who names the drawings. She titled my cherry blossoms Promise of Hope because of my mission: bringing hope and freedom to women with fibromyalgia, who are tired of being held prisoner in their own bodies. Those little buds of cherry blossoms are like the buds of hope that that were in my heart when I was sick. I didn’t necessarily have hope just yet, but there was a promise of hope. There’s a promise of hope for you too! Photo of Tami and Scott taken by Steve Harmon © SJ Harmon Photography 2006, all rights reserved. Used by permission. What a wonderful inspiration! Thank you for sharing your story. I know there are many others out there who don’t feel there is hope. You CAN defeat illnesses when you have hope. and until you get your own hope, find some people who you can borrow theirs from. This too, shall pass is another mantra I gain hope from. There are seasons in our lives. Some flowery and some wintery and barren. There will be change ahead. Thanks for sharing how to find hope for the better! The attitudes we have do affect us physically. There was a study done on first-year law students. The researchers asked the students a series of questions to determine how optimistic they were; then, the students would have their immune system tested. The more optimistic the student was right then, the better their immune system response. For those of us who have immune system issues, finding hope (optimism) is actually part of our healing! Tami, Thank you for sharing this beautiful story,of love, hope, and family. I thoroughly enjoyed your comments on how each family member–your mom, dad and hubby have influenced and shaped the new life you are living. As I thought about your family, I also thought about our support group–the love and hope we share and how we are a family too. I’m grateful for what you give and share. Your sweet fragrant spicy personality is a blessing in my life! Mavis, I’m so glad you stopped by! Thanks so much for your kind words. You’re so right about our group. I’m always amazed at the experience and wisdom each person offers. I also love how giving and understanding everyone is, and how willing they are to help each other out — especially the folks new to our group or newly diagnosed! hi! I found your website not long after i was diagnosed with fibromyalgia back at the end of 2011. I would consider myself a fibro newbie… I only began showing intense symptoms around the end of September 2011. Here I am now, finally on a medicine that is actually helping with my pain somewhat. I am so inspired by your work and your story. I love this story about the cherry blossoms. It is so ironic that about the end of September when I began feeling drawn to cherry blossoms. I have been wanting to get a cherry blossom tattoo to add to my collection but now that I have fibro I am thinking a tattoo would be way more painful now. Keep up your great work and keep inspiring! You are a beautiful person! Hey Kimberly! Thanks so much! ♥ Dad drew that picture for me and you can get prints and notecards from him at http://www.AcrewoodArt.com. I’ve been hearing about people getting spoon tattoos in honor of The Spoon Theory – but I’m like you. That just sounds WAY too painful with fibro! I have clients that say even wearing clothes hurts. I can’t imagine getting a tattoo! Although… if I ever do get a tattoo, I’ve got this scar from when I had a mole removed that looks just like a little bug. I think I’d get it colored in. LOL! As i sat here reading your story with tears, crying like a baby. While my husband, my support & hero for carrying my weight for so long & being so supportive & believing my pain & misery for over the past 10 years watching. I feel like your ad popped up on my Facebook page out of pure heavenly intervention. I relate to you in so many ways. Thank you!!!! I hope & pray I can be in your position one day…. I would love to chat with you and see what I might be able to do to help you get to my position. As you read, I haven’t always been doing as well as I am today! If you’d like to chat sometime, just click the Schedule Now button at the top right and it will give you my appointment calendar (in Pacific time – I’m in Oregon!) and you can pick a time that works for both of us. Tami, thank you for sharing your story with us and incorporating the beautiful cherry blossom as a symbol. I was diagnosed with psoriatic arthritis about 4 years ago, and then found that I also had fibromyalgia, and probably have had it for several years tho not knowing what it was. I am struggling to keep functioning some days even tho I am on many meds. I need to work, and thankfully enjoy what I do and have wonderful people who are understanding about my health challenges. I am looking for some alternative methods and have tried a few that seem to help, but looking for more ideas and hoping that you or a reader may know what to try. Your inspirational and positive comments are a blessing. Thank you. Candie – there are SO many things that can help! Believe it or not, there may even be a link with your psoriatic arthritis and your fibro. Some of the same things may help both. I would highly suggest scheduling a time for you and I to chat. That way we can talk about what you’ve already tried and I can suggest some new things for you. There’s so many options, and each body is different on how it responds. If you look on the right side of the screen, there’s a Schedule Now button that will take you to my calendar where you can book a time for us to chat. Your story is my story. As I write I am crying because someone feels exactly like I do. I confirmed I had fibro at 21 years old. I’m now 41. All of my young life all I ever heard was “you are so beautiful.” And I was fit. My weight battle began with my second bout of depression & the cocktail of meds & changes to them. Now I’m 225lbs and considered obese. This bothers me more than anything because I no longer feel beautiful. I know I’m beautiful on the inside and I’m a good mom, etc. but I just can’t get my brain to make the connection. It’s a struggle every single day. I love what the cherry blossom represents for you and for a while have been thinking about a small tattoo on my inner wrist to remind visually that I am beautiful and loved. I just stumbled upon your site and your explanation just resonated with me profoundly. This life is a journey every day & for some reason you crossed my path today & I’m taking that as a sign. Live today the best that you can. As Fibro Babes, we're all more alike than we realize. I find as I meet more and more women with fibro, we all tend to have the same basic issues and struggles. The issue of weight gain is one of them. A study done here in Oregon at OHSU found that the average weight gain for someone with fibro is 35# since diagnosis, but 50# since their high school weight. This is amazing. I have always loved cherry blossoms, even as a child. Now I have the joy of having a cherry tree in front of my house, and I can see it out my window every morning! I look forward to it’s bloom every first week in May (also my daughter’s birthday!). I will look forward to it even more now that I’ve read this article and will hopefully draw strength from its beauty! Thank you so much for sharing! Thanks, Tracy! Your comment gave me a huge smile. =) My parents have a cherry blossom tree at their house. I’d love to have one at mine too, for the reason you suggest. At least I have the drawing Dad made for me! Hi,, ive been suferring for years and now at my age 52 its harder To deal with it. It seems like the more i tell my doctors the less they believe me. Im tired of pain im tired of different meds for most of them im allergic To..the as ide effects are as bad as the fibro..medical Bills are piling up and im stressing..what can i do? There are a lot of effective treatments that help with fibromyalgia: acupuncture, myofascial release massage, and more. There are also supplements that can help. One that many of my clients take is Meriva-500 by Thorne Research. It’s an anti-inflammatory made from the curcumin in turmeric. It doesn’t cause the rebound pain or stomach issues that taking something like Advil would. You might want to give it a try. I’d also love to chat with you about more things you can do and ways I can help you. I have several client celebrations (testimonials) you may want to check out. You can schedule a complimentary Story Sharing Chat & Consultation online here. Even though we spent the weekend together at Leaders Against Pain Training, and I felt an immediate connection to you. < I wish I had read your story before! I knew you had a positivity and welcoming smile. With no idea what your life had been. I, now, understand what a Health Coach entails. I am looking forward to working with you in advocacy. and I am soooooo happy we met. Proud to call you friend!!!!!!!!!!!! That is a wonderful story. I am so happy for you. I think even the cherry blossoms have their trying times, still they never lose their strength/beauty. The same way are all the women out there who never give up, never give in, life is amazing and beautiful even in the hard times. One of my favorite quotes is “Character cannot be developed in ease and quiet. Only through experience of trial and suffering can the soul be strengthened, ambition inspired, and success achieved.” by Helen Keller. We have to remember that every situation in our life is there for a reason, I’m a huge believe that everything happens for a reason, and those situations are there to build us up, to help us evolve and improve. I think is safe to say that you are a winner and a champion after the experience you had. Thank you so much for your response. Tami you mentioned that you take LDN for Fibro. Can you please tell me for which Symptoms of Fibro it helps with. My primary symptom is horrible pain in my body. Particularly in my neck, shoulder foot and knee and legs. I am almost disable. My fatigue is much better with vitamins but for pain nothing is helping. Can’t take care of my 2 little kids. My new thyroid results after taking armour thyroid 30mg for 6 weeks are free t3 2.50, total t3= 77, thyroid antibodies =24 , tsh= .89 and , reverse t3= 13. Hi Shweta! Sorry for the delay in responding. Your note got mixed in with a bunch of spam. =( Sorry! LDN helps with a bunch of things. It modulates your immune system (so boosts it if it’s low, calms it down if overactive). It also increases your endogenous opioids (your natural pain killers), which helps to reduce your pain levels. It can even help mood, digestion, and more.